Full disclosure, I am a complete luddite when it comes to most advances in technology. I had a dumb phone until just recently, and I still own an 87 VW golf (with an 82 diesel vanagon engine, to boot! ), though that car is on its way out. A couple months ago, I became probably the first ever Rakkup guidebook author to have released a Rakkup guidebook, without having a smartphone. I joined with Rakkup in the first place only as a tool to help me get started publishing my print guide, and that is because I love books. I love how they look, smell, and feel. I especially love climbing guidebooks. 1. Rakkup guidebooks have GPS navigation. Yes, this works when you don’t have 3-g, or cell signal. Yes, it works really well. Yes, it makes trail navigation easier than any print guidebook ever did, or the mountainproject app. Yes, this is a game changer. If you’ve ever hiked around Red Rocks in the desert trying to figure out which social trail to take through the thickly vegetated arroyos, you know why. Navigation is awesome, hands down. 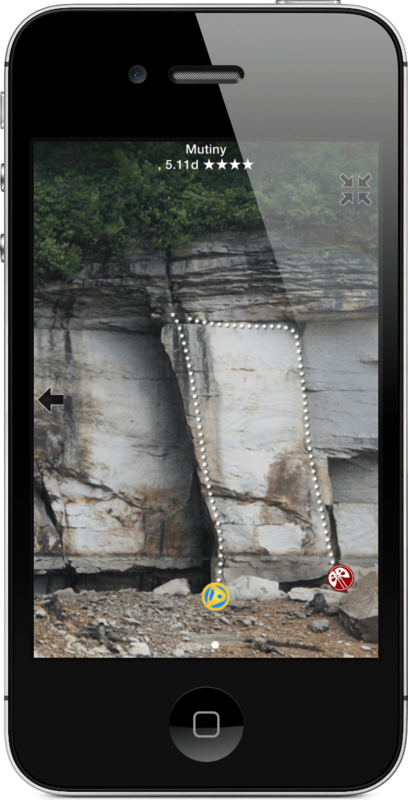 More photos allows you to zoom in and get a better look at where routes you want to climb are. 2. Rakkup gives more beta PHOTOS. A picture is worth a thousand words, you know. A print guidebook is limited in its use of photos because you don’t want it to end up the size of Webster’s Dictionary. The downloadable smartphone guides that Rakkup provides, however, do not face such limitations. 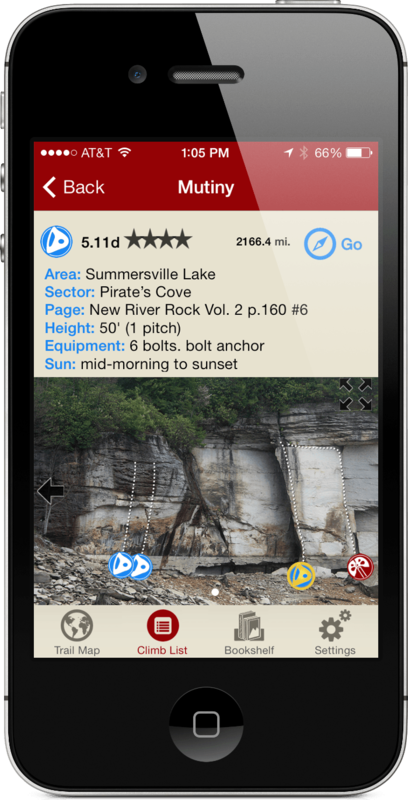 Hence, authors have the ability to post “belay view” photos, overview photos, and more for each and every route in the guide. This drastically helps in finding the starts of routes, and cuts down wallowing time looking back and forth from handdrawn topos, to walls, scratching your noggin. Narrowing down your route selections using Rakkup’s filter. 4. Rakkup guides are NOT crowdsourced. They are written by local guidebook authors who know the area like the back of their hands. So route grades and beta reflect historical accuracy, not the opinions of anonymous contributors who may or may not know what they are talking about. Also, each rakkup guidebook is specifically tailored to its area, and that comes through in the organization and quality of the data in that book. Routes are well ordered along the wall, and not listed haphazardly as in many MP areas. Furthermore, there are no advertisements, and no spray forums where the vast community of climbers all chimes in on where and when to stick your #2 camalot. 5. Rakkup guides allow you to quickly search the route database for exactly what you are looking for. You could fill in the parameters: sunny, sport, 5.9-5.10, 3-4 stars, click a button, and have a list of routes that qualify almost instantaneously. This is groundbreaking. I know MP does something similar, but the format for MP’s app is just clunkier than Rakkup’s all the way around, and less easy to use. 6. And this is really what sold me on Rakkup… Rakkup’s software provides a powerful publishing suite for bringing your print guidebook to fruition. They have photo editing, and map drawing tools with icons and functions specifically tailored to guidebook making. Currently, Rakkup is working on the ability to export all the data in your Rakkup guidebook to Adobe Indesign, which allows you to transition smoothly from digital to print guide when you are ready to do so. They are not to the point yet where they can do this with just the click of a button – but after seeing their progress over the last couple years, I know that will be in the not so distant future. Being able to publish and distribute your Rakkup guide WHILE working on your print guide is an incredible way to provide SOMETHING to your local climbing community while your print guide is still in the works. At first, I felt kind of funny working on a digital guidebook, since I feel so strongly that print guidebooks maintain the important history and traditions that make climbing areas special. Now, though, I see digital guides and print guides as complimentary, not competitive resources. Digital guides are just hands-down better at getting you to the base of the routes you want to climb. That said, print guidebooks are superior resources for generating stoke for an area, and celebrating the spirit of your favorite crags. Personally, I’ll continue buying guidebooks to the places I love to climb. I like the tangibility of something in my hands, being able to flip pages, reading tales and lore about the area from a page rather than a screen. But if I’m ever unsure of where I’m going, or if I’m visiting a new area, I’ll be buying rakkup guides. Just imagine if you wanted to tour Spain’s 8bazillion different crags, for a one month holiday… Would you want to buy and carry guidebooks to El Chorro, Margalef, Siurana, Terradets, Tres Pons, La Pedriza, Santalinya, Oliana, Montserrat, and a whole grip of others, or would you prefer to get one month subscriptions to all of them conveniently held within your little smart phone, for a few bucks a pop? Releasing the Index guidebook on Rakkup has allowed us to get much needed beta to the public long before our guide goes to print! I think it won’t be long before Rakkup is dominating the guidebook industry. Like technology in general, the advances will happen whether we like them or not. Take it or leave it. In the case of Rakkup, I’m pretty excited that the technological advance coincides with my predilections. In other words, I’ll take it! Rakkup is available for both iphone, and android; and there are more titles to choose from all the time. To learn more about Rakkup, or purchase guidebooks, visit www.rakkup.com. 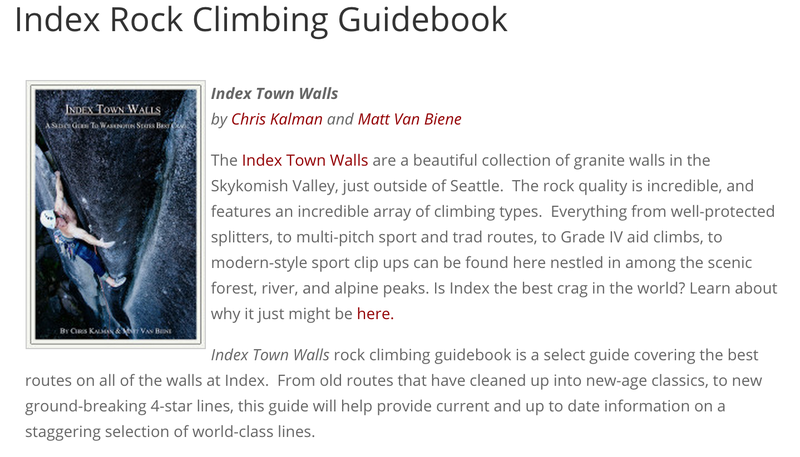 You can find the Index Town Walls Guidebook, along with many other fine titles, here.